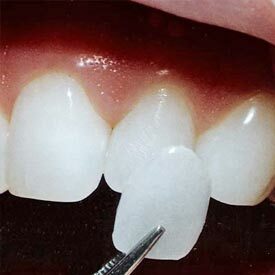 A veneer is a thin shell of porcelain or plastic that is bonded to a tooth to improve its color and shape. A porcelain veneer generally covers only the front and top of a tooth. Porcelain veneers can be used to close spaces between teeth, lengthen small or misshapen teeth, or whiten stained or dark teeth. Call Cornerstone Dental at (403) 995-1800 to request your Porcelain Veneers appointment today.